Name of the ancients for the strait of Yenikale or of Theodosia; on the eastern coast of the Black Sea. The country on both sides of the Cimmerian Bosporus formed in ancient times the kingdom of Bosporus, the latter name being the reading of the Vulgate for Sepharad ( ). Jerome adopted it from his Jewish teacher, who considered it to be the place to which Hadrian had transported the captives from Jerusalem. But Jewish communities existed in Bosporus long before the destruction of the Temple. King Agrippa I., in a letter addressed to Caius Caligula, speaks of the Jews established in the Greek colonies of Pontus (Philo, "Legatio ad Cajum"). Among many Greek inscriptions unearthed in 1830 on the banks of the Bosporus, two are of especial interest for the history of the Jewish settlement in that Greek colony. One of these, found at Pantikapæum (the modern Kertch) and dated 377 of the Bosporian (81 of the common) era, is a declaration of the liberation by a Jewess named Creste of her slave Heraclius. The deed is said to have been drawn up in the synagogue of Pantikapæum. The second, unearthed in Gorgippia and dating from 338 of the Bosporian (41 of the common) era, is indeed a paganinscription; but the Biblical name of God used at the head of it shows the influence exercised by the Jews upon their fellow-citizens. 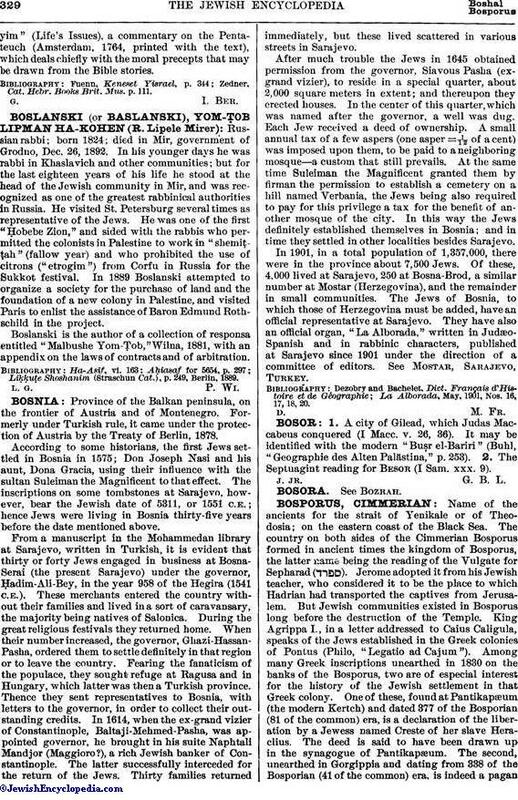 A quite recent discovery of Jewish Greek inscriptions was announced Jan. 12, 1901, to the Imperial Russian Geographical Society. A young explorer, A. L. Pogodin, discovered and deciphered new inscriptions in Kertch and other places in South Russia, from which it is clearly evident that Jews settled in the Bosporus as early as the fourth century B.C., and were an important section of the Greek colony. They had their cemeteries, synagogues, and other communal institutions. In trade as well as in social life they mingled freely with the Greeks, as is evidenced by the fact that the language of the inscriptions is Greek. Other inscriptions show that, in the first century B.C., the Jews founded in the Bosporus a colony of their own. In the inscriptions of the third century of the common era Jewish religious symbols and sepulchral inscriptions are found. 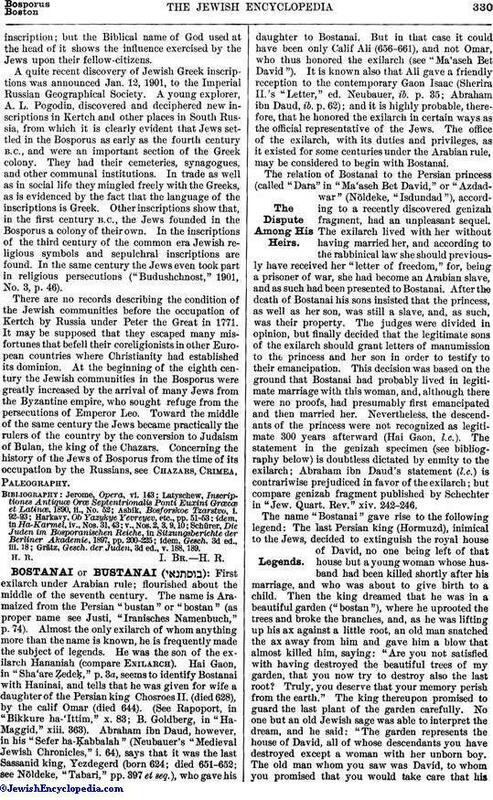 In the same century the Jews even took part in religious persecutions ("Budushchnost," 1901, No. 3, p. 46). There are no records describing the condition of the Jewish communities before the occupation of Kertch by Russia under Peter the Great in 1771. It may be supposed that they escaped many misfortunes that befell their coreligionists in other European countries where Christianity had established its dominion. At the beginning of the eighth century the Jewish communities in the Bosporus were greatly increased by the arrival of many Jews from the Byzantine empire, who sought refuge from the persecutions of Emperor Leo. Toward the middle of the same century the Jews became practically the rulers of the country by the conversion to Judaism of Bulan, the king of the Chazars. Concerning the history of the Jews of Bosporus from the time of its occupation by the Russians, see Chazars, Crimea, Paleography. Grätz, Gesch. der Juden, 3d ed., v. 188, 189. H. R. I. Br. H. R.